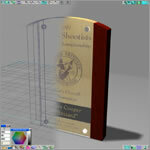 Whether you are looking to have a single award custom designed and fabricated to your exact requirements, or need custom components laser cut/engraved/marked for a personal project or your business, Marked by Imagination offers a number of specialized services, for both consumer and commercial applications, that can help you take your ideas and concepts and turn them into realities. If you have a general idea for a project, but need to further define the specifics and develop a final design, we can work with you to turn your ideas and/or rough sketches into a fabrication-ready design complete with measured drawing(s). 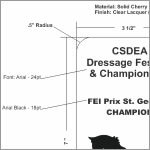 Once you have a finalized design, we can laser cut and/or custom fabricate your item and add laser engraved text, graphics, logos or photos to complete the project. If you need to visualize what various materials or colors would look like for a particular custom design, we can produce textured 2D or 3D visualizations with various material and/or color combinations for you to review. This is particularly useful for projects where it may be difficult for decision makers to develop an accurate mental picture from a simple line drawing and material descriptions. 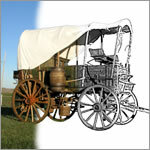 If your project requires custom graphics, corporate logos, or photographs, we can edit images and logos to your specific requirements, enhance and optimize the graphics/photos to ensure the best final results on your selected medium(s), and layout the text, graphics, and photos to your exact specifications. Are you a hobbyist or woodworker that needs to have a single item laser cut for a special project, or does your company outsource laser cutting of components for a product you manufacture? Our state-of-the-art laser systems are capable of producing extreemly intricate cuts in a variety of materials that would be virtually impossible by any other method and we can handle single piece cutting jobs to moderate volume production jobs. 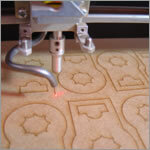 Our laser systems can cut materials up to 24"x18" in size and up to 1/2" thick depending on the material. 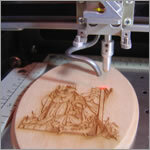 Please reference our Laserable Materials Matrix for a list of materials that can be laser cut, engraved, or marked. 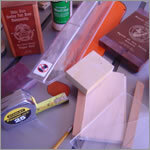 Would you like to engrave your company logo into an item you manufacture or custom packaging such as a wood gift box? Do you have an item you would like to have personalized for yourself or as a gift? Our laser systems allow us to take virtually any comination and layout of text, graphics, logos, or photos and engrave them with intricate detail (up to 1200 dots per inch) on a wide variety of laser engravable products and materials. For a list of these materials please reference our Laserable Materials Matrix. Our laser systems can engrave items and materials up to 24"x18" in size and up to 11" tall depending on the overall shape of a particular item. Please reference our Laserable Materials Matrix for a list of materials that can be laser cut, engraved, or marked. Do you have metal parts or tools that you need marked with text such as a part number, serial number, or a graphic such as a company logo? 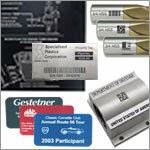 We can directly mark anodized aluminum items and some coated or painted metals. Other metals such as stainless steel, bare aluminum, carbon steel, and chrome plating can be marked utilizing a special metal marking compound that when hit with a CO2 laser, produces a permanent, high-contrast mark that is bonded to the surface of the metal. Marked by Imagination maintains an on-site woodshop which gives us the ability to fabricate truely custom pieces for our clients. If you can't find an item that fits your needs, we can custom design, fabricate, and laser engrave the perfect item for you.